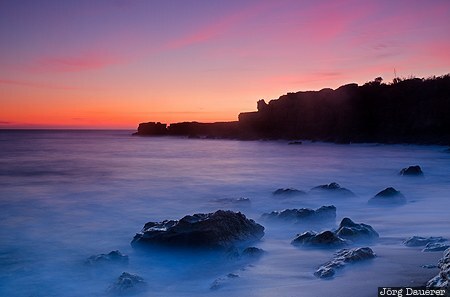 The tide moving in over the rocks of the beach Praia do Castelo below a colorful sunset sky. A long exposure time was used to make the motion of the water visible. Praia de Castelo is west of Albufeira in the Algarve in southern Portugal. This photo was taken in the evening of a sunny day in March of 2011. This photo is part of the exhibition The Beach (June 2015). This photo was taken with a digital camera.